Bake a sheet cake the size that you will need. 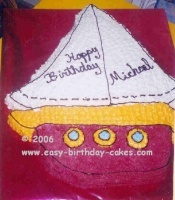 With an icing filled bag and round tip, size #5, draw a sailboat on the cake top. Cut the cake away from around the outline. Make a yellow icing and use star tip, size #18 to cover the top rim of the boat and the three circles on the side of the boat (refer to the above photo). Make a small amount of sky blue icing and using the same size star tip, size #18, fill in the center of the yellow circles. Make a red colored icing and cover the bottom of the boat with star tip, size #18. Use star tip, size #18 and white icing and cover the sail of the boat. Make black icing and using round tip, size #5, outline the entire sailboat referring to the picture above. Write your birthday message on the sail.